Grace Immersion · What is The Grace Immersion? 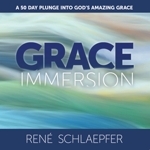 What is the Grace Immersion? Maybe you’re just starting out as a Jesus-follower. Maybe you’re still exploring. A study of grace will introduce you to the amazing, fascinating core concept of the Christian faith. But what if you’ve been a Christian for years? Is this too basic? No, the Bible says, “grow in the grace and knowledge of our Lord and Savior Jesus Christ” ( 2 Peter 3:18a ). The doctrine of grace isn’t just for new believers. It’s something we’re expected to grow in as Christians. But why? Let me put it this way. In college I had a roommate who was one of the most uncouth people I had ever known. If there were the slightest excuse to make a disgusting bodily noise, he’d make it. He wore clothes right out of his dirty laundry pile. Showered once a week (whether he needed it or not!). Told me he was saving money and “avoiding the narrow definition of acceptable odors foisted upon society by pharmaceutical companies” by never wearing deodorant. I argued, pleaded, even mocked him… to no effect. Then almost overnight he changed. Washed and ironed all his clothes. Smelled great. Spoke with eloquence. The reason? He fell in love. Suddenly he was delighted to change because of the influence of his new relationship. Something like that happens when you grow in grace. Once you understand the depths of God’s grace, everything changes, from your manners to your activities — and not because someone nagged you either. Because of your new relationship, you’ll be changed by love. In his excellent book The Grace Awakening , Charles Swindoll has a great list, that I abridged and added to here, of the ways a study of the doctrine of grace changes you. You can expect to gain a greater appreciation of God’s gifts to you and others. You’ll find your joy and peace growing because you’re noticing God’s grace all around you. You can expect to spend less time and energy critical of other peoples’ choices. When you get a grasp on grace, you become less petty and more tolerant. You’ll be surprised how relaxed this makes you — and how much easier conversation about Jesus becomes. You can expect to take a giant step toward maturity. You’ll learn more effective ways to grow and change. You’ll find yourself cultivating authentic faith instead of a superficial religion. You can expect to better understand how the whole Bible fits together, each element revealing something new about God’s grace. You can expect to be freed from dry, performance-based religion. If you’ve been plagued by a nagging feeling that God is distant, expect that to diminish or even disappear! So if you’ve been looking for more joy in your daily life, more consistent victory over temptation, a sense of greater closeness to God, and healthier relationships with others, a study of grace is the place to start! In fact, it’s the only really effective place to start. Most systems of self-improvement, religious or not, amount to my efforts as a roommate to cajole my friend into changing. They just don’t work, at least not for long. What will change you… is love. How do you hope to change during this grace study? Which items on the list do you most long for? Ask God to help you grow in your understanding of the depths of His grace to you during this study. Go through the list and ask God to develop each of these results in your life during this study. Pray with real expectation!